It doesn’t matter if it’s your first time hosting the family for the holidays or the tenth, we can all use backup from time to time! Don’t stress about how you can throw the best party, just follow our 3 easy tips below and your guests will be raving about it for years to come! To really make an impression as a hostess, you need the mostest…. delicious treats! If you want mmmm-inducing food, look no further than your favorite hometown bakery: Dewey’s Bakery. Below we’re sharing some great recipes you can make with our Moravian Cookies. Your favorite flavor of jam – we love Sugar Plum! Pre-heat the oven to 325 degrees, and line a 13″ x 9″ baking pan with aluminum foil so that the foil extends over the sides of the pan. With a food processor, grind the full tube of Moravian Cookies into a powder. In a bowl, mix cookie crumbs, butter and 3 tablespoons of sugar and press into the bottom of the pan. Bake for 10 minutes. In a bowl, beat the cream cheese, flour, vanilla and 1 cup of sugar with an electric mixer at medium speed. Once all ingredients are fully blended, add in the sour cream and blend. Then, add the eggs one at a time, beating at low speed between each egg. Pour the mixture into the pan, spreading evenly. Add dollops or lines of jam, then use a knife or toothpick to cut through the batter and make a pattern. Bake for 40 minutes. When done, the center may still look like liquid, but it will be dry to the touch. Let cool completely, then refrigerate for at least 4 hours (the best texture will be achieved by refrigerating overnight). Remove the cheesecake from the pan using the foil as handles. This recipe makes about 16 servings. Scoop ice cream onto the bottom cookie. Top ice cream with the second cookie. Roll cookie sandwich in crushed peppermint pieces. You can crush them using a food processor or use a ziploc bag a and a rolling pin. Freeze for at least an hour to allow the ice cream to freeze and the cookies to soften. Plan activities to bring everyone together. Initially your guests will stay entertained with one another, catching up with family who live out of town or friends who are visiting. But to host the best holiday party, you’ve got to keep them entertained! Warm up the pipes for karaoke. Or, set up an impromptu photo booth where you friends and family can pose and create fun memories of the evening! Create a fun, festive backdrop and some props to go with it, like a Santa Claus beard on a stick and a Reindeer headband with antlers on it. You could even set the photos up to be a part of a slideshow somewhere else in the party, or use them for next year’s Christmas card! Do your guests usually bring gifts for other family members? Rather than the usual traditional gift-giving, why not try something new this year? This one is a classic, but in case you’re not familiar with it, here’s how it works – place the name of each guest into a hat and have everyone draw a name. You can also use an online randomizer like Elfster to assign names for you. You are “Santa” for the person whose name you draw. This way, each guest only has to worry about one gift. As each person opens their gift they have to guess who their “Secret Santa” is! Again, every person is only required to bring one gift at a certain price point. All of these gifts are kept in one place near the tree. When it’s time to open the gifts, the first person chooses which gift they want to open. Once they’re done, the next person can either choose another gift or they can steal the gift from the individual before them. This goes on and on until everyone has a gift. The rules vary depending on who is playing, but typically once a gift has been stolen 2-3 times, it cannot be stolen again. This game requires oven mitts, a Santa Claus hat, two dice, and for every guest to bring one wrapped gift. When it’s time to begin exchanging gifts, everyone gets in a circle around a table or on the floor. The person who starts the game will pick a gift, put on the oven mitts, put on the Santa Claus hat, and then try to open the present. At the same time, the next person in the circle will start rolling the two dice. When they roll a pair (the same number on both dice), their turn will begin. Then they have to put on the oven mitts and the Santa Claus hat, and try to open the present before the person next to them rolls a pair on the dice. It’s harder to open those gifts than you’d expect when you have those thick oven mitts on! If you grew up in the South, you know it’s a holiday tradition to put together “goodie bags” filled with fruit, candies, and nuts for the children of the family. But why stop at the kids? Send all of your guests home with a bag full of goodies and toss in our mouth-watering Dewey’s Bakery Moravian Cookies for a perfect treat too! Bonus Tip: Even if you live in Winston-Salem, you can save yourself a trip to the store and purchase all your favorite treats online at Deweys.com. Plus, you don’t have to pay for shipping on any order $24.99 or more, so you won’t pay any more when you order online! 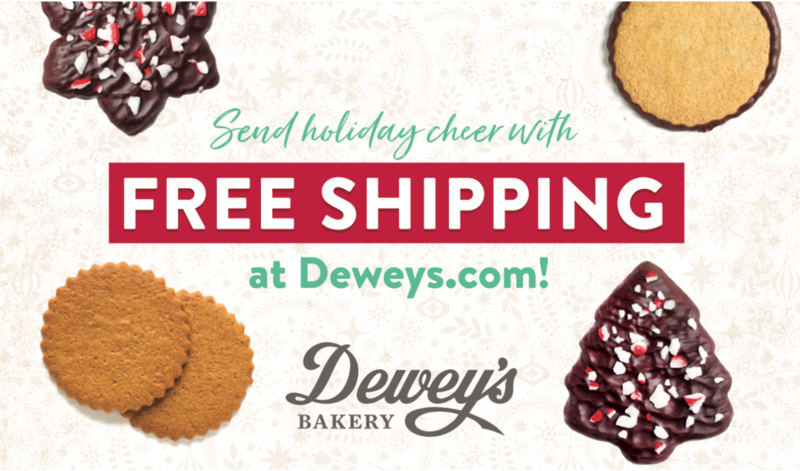 The BEST tip we can give you for throwing a holiday party to remember is to always have mouth-watering treats on hand, and what better way to make sure you do than to enter our contest to win one year’s supply of Dewey’s Bakery’s crackers and cookies!